Other companies take note, because this is the kind of bold marketing strategy that really makes an impact. Gillette has just announced that Planters nuts’ mascot, Mr. Peanut, is now their mascot too! It looks like somebody at Gillette deserves a raise! The advertising world officially has its biggest story of the year. Gillette unveiled its innovative decision to have Mr. Peanut be its mascot in a public statement from its board of directors earlier today. 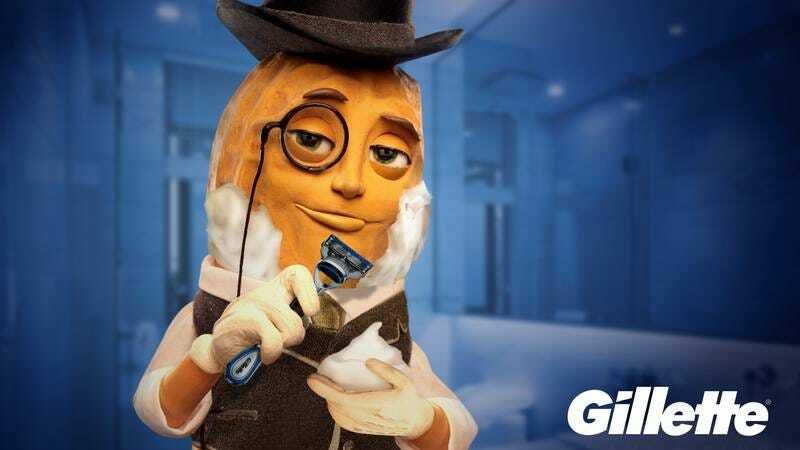 The company, which specializes in razors and other shaving supplies, stated that Planters’ well-dressed, affable peanut mascot would immediately begin appearing in all Gillette advertisements and would be featured prominently on all packaging for Gillette products. Marketing experts are already praising Gillette’s decision to use Mr. Peanut as its mascot, noting that Mr. Peanut is a very recognizable character and is quite popular among consumers. Absolutely incredible. Considering how popular and recognizable Mr. Peanut is, it’s amazing that nobody at Gillette thought of making Mr. Peanut the company’s mascot sooner. From now on, when people see Mr. Peanut, they won’t just think of peanuts, they’ll also think of the many Gillette products that Mr. Peanut uses to keep his peanut shell hairless and smooth. People are going to be talking about this visionary branding shake-up for years to come!